When delivered in conjunction with North Kiama Bypass, the link will deliver 4 lanes from Sydney to Gerringong, thus removing bottlenecks for economic development of the NSW South Coast. The works are scheduled to follow completion of the North Kiama Bypass. Work is expected to commence in 2006 at an estimated cost of $100m over 4 years. The existing route south of Oak Flats Interchange to the junction with Shellharbour Rd at Dunmore includes a section of approximately 3 kilometres of winding two lane two way road. This link between Oak Flats and Dunmore has low travel speeds, causes bottlenecks during holiday periods and has a poor crash history. It is a source of traffic congestion particularly at the end of holiday periods as tourists are travelling to or from the South Coast. 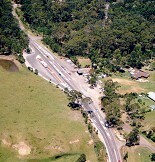 There have been 48 crashes over the last three years along this section of the Highway Pictured above, work on the North Kiama bypass (photo taken in March 2002). The single lane of winding narrow road adjacent to the Minnamurra River will be eliminated and urban residential traffic conflicts removed. Works commenced in 2001 with an expected completion date of 2006 at an estimated cost of $140m. This sector of the project is to divide carriageway generally along the route of the existing Highway southward from the Kiama bends (including bypass of Berry) to Toolijooa Road. A route selection study is required to determine preferred option from Toolijooa Road southwards to Berry. The works have been estimated at $195m, with no commencement date announced. 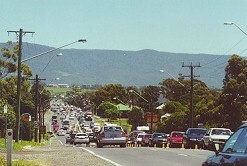 A bypass of Berry is proposed but cannot be finally determined until a final route is selected for the Gerringong to Berry section and its entrance into Berry from the north. Dual carriageway is planned generally along the route of existing Highway at an estimated cost of $120m, with no programmed commencement. As part of this overall solution will be the need to identify an additional crossing of the Shoalhaven River. 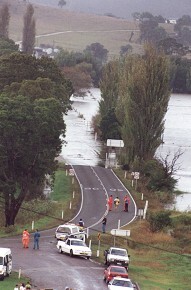 Ultimately a bypass of Nowra will be required. This sector of the Princes Highway services three important freight industries – the dairy processing industry, the timber industry and the fishing industry. There are two impediments – in terms of physical infrastructure, the old wooden bridge across the Pambula River flood plain must be replaced. 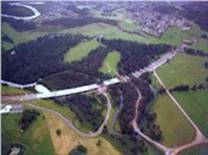 As it is subject to flooding, the replacement bridge must be reconstructed to a standard of at least 20 year flood free level. Inconsistent regulations covering freight movements between Victoria and NSW put the region at a considerable disadvantage. The Pambula bridge issue has become a political football in recent months with the NSW Government insisting that the Commonwealth should fund half of the cost of a new crossing. However, Federal Transport Minister John Anderson has refused to fund a new bridge through the Roads of National Importance Program, saying the State Government is responsible for it. Bega Valley Shire Council and the community have fought a long battle for many years to have the 110 year old two-lane timber bridge replaced. When the Pambula River floods, the bridge and its approaches are cut, sometimes for days on end, severely disrupting traffic on the Princes Highway, which is the main coastal road artery between Sydney and Melbourne.